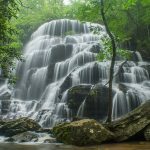 Waterfalls abound in the Andrew Pickens Ranger District of Sumter National Forest. 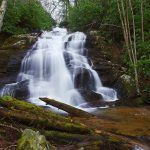 This moderately strenuous hike through the mountains of eastern Tennessee follows an old logging trail to the 100-foot Big Falls on Lower Higgens Creek. 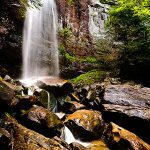 Several creek crossings and caves mark the remainder of the path to Birchfield Camp Lake. 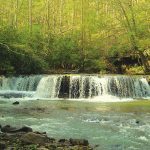 Just two miles away from busy Interstate 77, visitors to West Virginia’s Camp Creek State Park trade the hum of passing traffic for birdsong and the rushing chatter of waterfalls.